Num Pang, the Cambodian-accented sandwich shop that launched near Union Square, has opened a branch in The NoMad Hotel. The menu at the new location is largely the same. Num Pang, The NoMad Hotel, 1129 Broadway, New York, NY 10001, 212-647-8889. The appeal of the meatball endures. Exhibit A: The Meatball Shop has just opened up in Chelsea, the seemingly umpteenth outlet of the popular restaurant that first debuted on the Lower East Side. 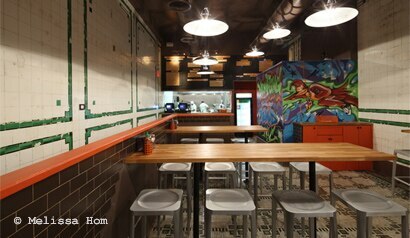 The Meatball Shop, 200 Ninth Ave., New York, NY 10011, 212-257-4363. Nightingale 9 is a new Vietnamese restaurant from the people who brought you Seersucker and Smith Canteen. To do research for the menu, chef Robert Newton traveled in Vietnam last year, eating his way through the Southeast Asian country. Nightingale 9, 345 Smith St., Brooklyn, NY 11231, 347-689-4699. Boqueria owner Yann de Rochefort and Spanish chef Dani Garcia have teamed up to open Manzanilla, a brasserie-like Spanish eatery with décor that leans toward Andalusia. Manzanilla, 345 Park Ave., New York, NY 10154, 212-255-4086. Newly opened Ciccio is a collaboration of Florentine chef Giacomo Romano and Sam Leung. The restaurant, naturally, serves up the cuisine of Tuscany in a rustic atmosphere. Ciccio, 190 Sixth Ave., New York, NY 10012, 646-476-9498. Thirty-five restaurants are participating in Japanese Restaurant Week running from March 4-18. Over 21 regions in Japan will be represented, allowing the hungry diner to take a virtual eating tour of the country. Participating restaurants include Megu Midtown, Blue Ribbon Sushi, and Aki on West 4th. For more information, visit japanweek.us. Gordon Ramsay took a lot of heat when his team bought the UK trademark to the name The Spotted Pig. He has since won the rights to the name but after the action scandalized the British chef, he happily turned it over to April Bloomfield, chef and partner of the popular West Village gastropub, The Spotted Pig. The Spotted Pig, 314 W. 11th St., New York, NY 10014, 212-620-0393. Beatrice Inn, the latest from magazine editor Graydon Carter, has just found its third chef: A Voce alum Hillary Sterling. Beatrice Inn, 285 W. 12th St., New York, NY 10012, 917-566-7400. Mulberry Street Italian-American favorite (at least with tourists) S.P.Q.R. has overcooked its last bowl of spaghetti. The restaurant recently shut down for good. S.P.Q.R., 133 Mulberry St., New York, NY 10013, no phone.